Staff from Northern Ireland's largest further education colleges have been protesting in Belfast at the prospect of job cuts. 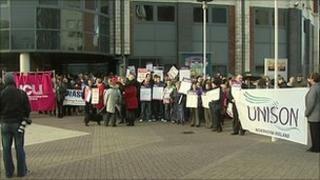 The protest was at the Belfast Metropolitan College campus in the west of the city. Trade unions have warned about 450 jobs could be lost across Belfast. In November, Employment and Learning Minister Danny Kennedy said the college could lay off up to 168 staff. The unions involved are now officially in dispute with the college. It has made no comment on the dispute and said it would issue a statement to staff on Tuesday morning. Pat Lawlor, from the Stop the Cuts Alliance, said such extensive cuts did not make economic sense when unemployment continued to soar. "The full extent of the cuts at the Belfast Met is you're going to see at least 450 jobs gone across all sections of the workforce," he said. "You're going to see an impact on those workers alone through unemployment and obviously the impact that's going to have on their lives. "But you're also going to see a 33% cut in the teaching time for students. Now that's clearly going to have an impact on their ability to get a decent and good education that they're going to need for the future." Monica Goligher, chair of the University and Colleges Union, said at least 120 college staff were going to lose their jobs along with 93 part-time workers and 150 agency staff. Mr Kennedy said redundancies at the college were "regrettable", but it was hoped many would be voluntary and through natural wastage. The college currently employs more than 1,000 staff.